Re: Where is the Audio Out on My UN55NU7100? Where is the Audio Out on My UN55NU7100? I have a hearing deficit and use a Sennheiser Assistive Hearing set (transmitter and receiver) while watching TV which normally plugs into the headphones port with a standard 3.5mm plug. My newly purchased UN55NU7100 does not have a dedicated headphones port. The "Connection Guide" on the TV explicitly mentions the ability to choose between "Optical and Audio Out" illustrating the different cable connectors for each. Damned if I can find something that works using one of the two coloured ports which are labelled AV In and Component in, nor find any other port. The manual, such as it is, is a joke. Am I missing something simple and obvious (complicated and not obvious?)? Grateful for your help with this. there is no analogue audio out (3.5mm or other type). The optical audio out looks like the original TOSLINK square port, which never carries any electrical connectors (unlike the 3.5mm round optical out which usually carries both optical and eletrical connectors. Your options are using a optical-to-analogue converter, or replacing the TV. If you use a simple converter, make sure the TV can output stereo PCM (Audio setting), if you use a A/V amplifier if should handle the TVs output formats. If you already have an A/V amp, just use the headphone jack to connect your 3.5mm plug (with a 3.5 to 1/4 inch converter). I've highlighted both the 'Digital audio output' (or 'Optical') at the top and the 'Audio/Video Input' ports. Unsure of the exact Sennheiser Assistive Hearing set you've got, so unsure of the exact connection options you have with it. Thank you. I really appreciate you spending your time on this. I will repost on the North American Board. The images you sent depict exactly what I have on my TV. I have one question and have come up with possibly a clue as to what is going on. 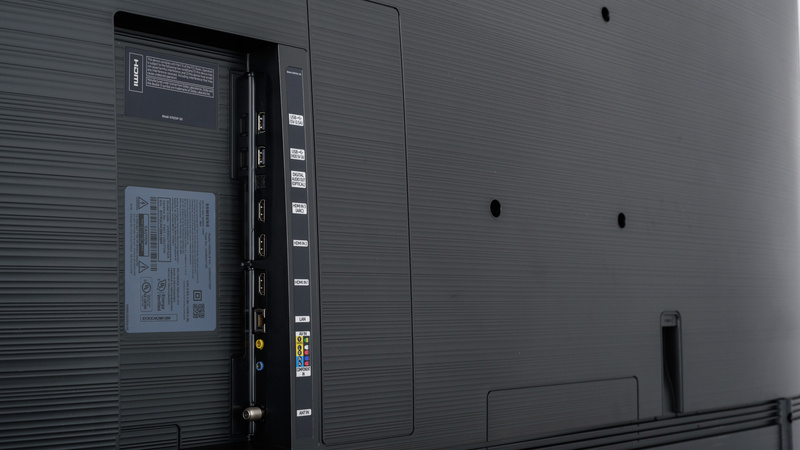 The question: Can the TV's digital optical-out transmit an analogue signal to the Audio device as well as an optical signal and would it be advisable to switch the sound setting from PCM to Dolby Digital? At the moment the two Dolby options are greyed out and it is set to PCM. The clue(?) Since sending my original post, I have obtained a DAC box and hooked it up to the tv's digital optical port and then to my Sennheiser transmitter. The strange thing is that the set-up works when viewing cable channels, but not when viewing Netscape, Plex or Amazon Prime as installed on the TV. Does that suggest anything to you? . I'm not too sure about that one, so I've asked one of my expert TV colleagues who knows more about stuff like this for their take on it. I'll get back to you with what they say as soon as they reply to me - but in the meantime if there's anyone in the Community who can offer their view, they're more than welcome to do so. Thanks for your message. I did obtain an inexpensive DAC converter which solved my problem. Still pissed though that Samsung removed an obviously useful and used function requiring an additional expenditure to resolve. According to the documentation, optical audio output works only when source signal is 5.1. Samsung NU557400 here (well actually 7405 from Spain). I also have this issue, there is no RCA output and I wanted to connect the TV to stereo monitors (KRK RP6G3) to replace TV speakers and improve stereo sound. I did a test with optical toslink using one of my DACs (Modi Multibit) and the problem with this is that you can't control volume (something you can do in Windows with a Realtek card). So optical is not a solution for me because I want to handle volume with the TV. So then I did a second test, connecting the TV to some Bluetooth headphones. With Bluetooth I can control digital volume from the TV. This would be my workaround. I'm planning on buying some Bluetooth to RCA DAC for this (likely SMSL B1) and use this to replace TV speakers while still able to control volume from TV (I hope this is an smooth experience). 1) I'm not sure if the TV supports Aptx over Bluetooth. The information is very limited, you don't even know the Bluetooth spec. with a PC (using optical as well) and you can do this in the TV when using Bluetooth. 3) it would be nice if the TV had usb DAC support. Very old and cheap android phones have USB DAC support it would be nice to have a 2019 TV with this support as well.